Using a wedding aisle runner isn't necessarily a "must-have", but it is a wonderful extra detail that you may want to include. WhereBridesGo.com features most of the products that you will need to throw a wedding, including some beautiful aisle runners. An interesting fact: people once believed that evil spirits lived beneath the surface of the earth, and an aisle runner protected the bride from being attacked by them. Today, they are used for both practical and decorative purposes. Here are some reasons why using one of these in your wedding could be a perfect fit for you. Walking on an aisle runner rather than the actual ground or floor can help protect the bride's dress from anything that might snag the bottom of the gown or a floor-length veil. It also acts as a barrier between your gorgeous wedding dress and the dirt that will inevitably be on the ground from guests walking on it to their seats. Using a runner down the center of the aisle adds a traditional elegance to the wedding ceremony, and it can make the bride's grand entrance more memorable. 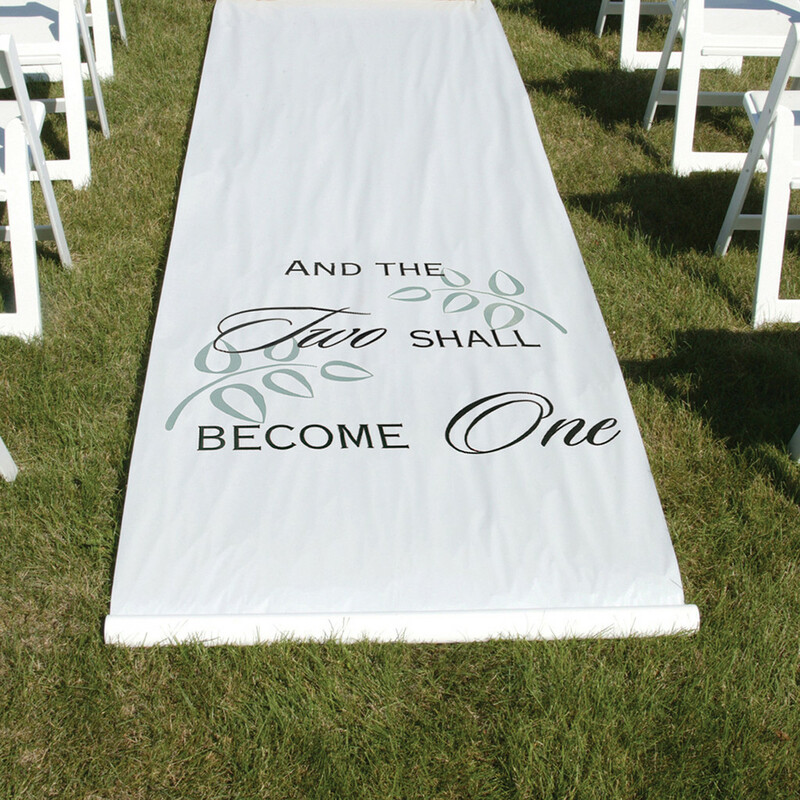 The aisle runners at WhereBridesGo.com can be personalized with sayings, your names, the wedding date, and wedding colors, and the personalization comes in a variety of lovely options. This makes our aisle runners as special as the love they represent. Always make sure that your aisle runner is secured to the ground. Most of ours feature an adhesive strip backing for secure placement. If you choose to use an aisle runner outdoors, double-check that you have it down well enough that it will not blow off of the ground easily. The pull cords on most of our aisle runners make it simple for your ushers to unroll it just before the entrance. If you prefer to have the runner already in place before the wedding, block the center aisle so that no guests walk on it, and let guests take their seats from the outer aisles instead. One idea that may be keeping you from purchasing an aisle runner is the fact that it will only be used once. While this is true, there are some wonderful things that you can do with the runner after your wedding to turn it into a sweet keepsake. Frame it: Cut out the personalized section of your aisle runner and frame it to be displayed in your home. You can even make a collage with some of your wedding photos around it. Make a wall hanging: Turn it into a decorative piece of art to hang from a rod on the wall. Sew it onto a quilt: That exquisite monogram that you picked out would look incredible sewn on to the front of a quilt or blanket to cuddle up underneath with your new spouse. The choice to use an aisle runner for your wedding is a personal decision. During the wedding planning process, discuss the pros and cons with your spouse. If it's easily within your budget, go for it! Check out the beautiful aisle runners available at WhereBridesGo.com to help with that decision. You may find something there you simply can't do without. Quite an interesting post on Aisle Runner. Thanks for sharing these details here. 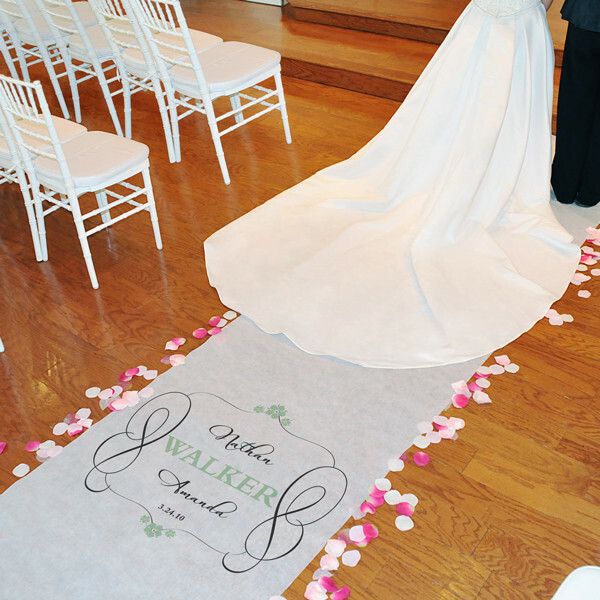 We are going to tie the knot at local wedding venues Los Angeles and will love to have such a creative Aisle Runner. I might contact you soon regarding this.